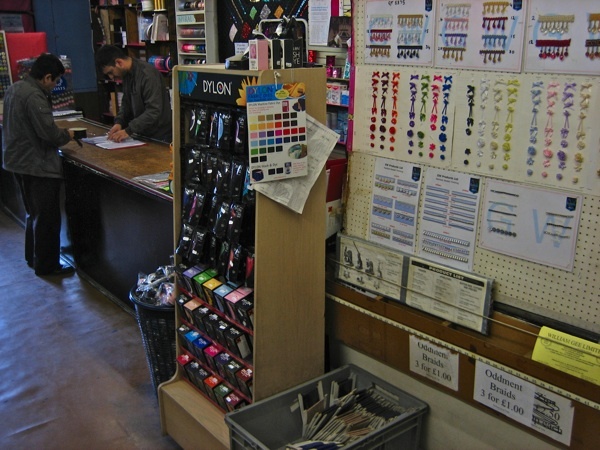 My guide was Jeffrey Graham, maestro of the proud company boasting London’s largest selection of zip fasteners. He led me up an old brown lino-covered staircase between walls panelled in wood-effect formica to the locked, dusty upper room lined with happy photos of works’ outings and jamborees of long ago. Here Jeffrey brought the title deed to the property dating from the sixteenth century when this was Henry VIII’s land – Henry was the king that the Kingsland Rd refers to – and he had stables here for hunting when there was still forest, recalled today only in the name of Forest Rd. Then, once we had established this greater chronological perspective, Jeffrey brought out the tiny sepia photograph of William Goldstein that illustrates where the haberdashery business began. 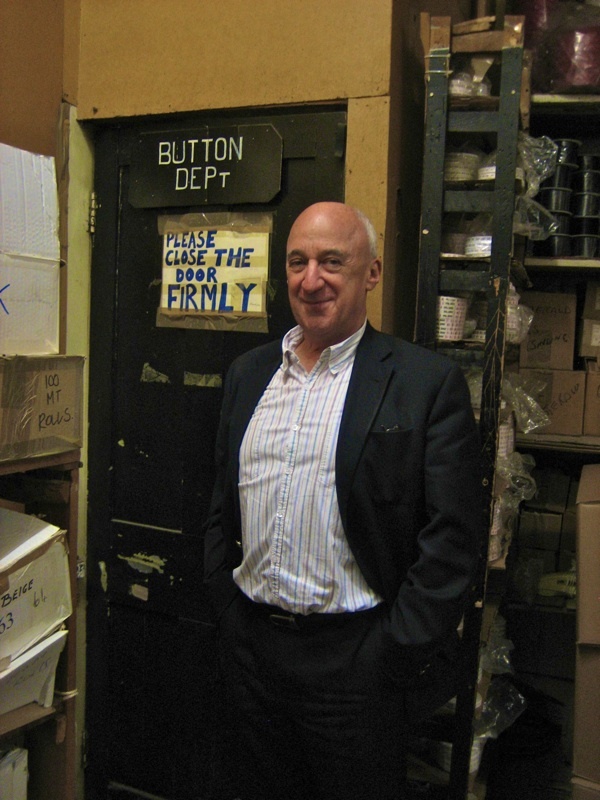 “William Goldstein started in 1906 with two pounds in the kitty selling buttons and trimmings, and he changed the company name to William Gee. This was across the road where Albert’s Cafe is now, but after several years he needed larger premises and moved into the current building. He had two sons, Alfred & Sidney, and I knew both of them. Alfred died in 1970 and Sidney worked until he was eighty-five, and died four or five years ago. 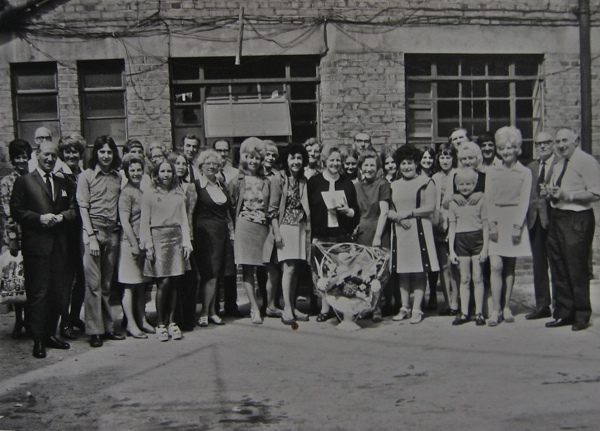 They grew the business and made it one of the largest of its type in the country, at a time when there was a large textile industry in the East End – which was full of clothing factories until a few years ago. In the middle of the last century, there were more than eighty people working here. I remember coming in as a child and there were twelve ladies who all had their own button-making machines for covering buttons and they’d all be sitting there jabbering away making buttons, and some had machines at home and even carried on making them there too. When I was twelve or fourteen, I did a holiday job helping out and going out on deliveries with the drivers, so I saw a lot of the places we delivered to. My impression was that everything was bustling, everyone was busy, no-one had any patience and everyone knew everyone. My father, David Graham, had a similar business at 77 Commercial St. He served all the factories in the little streets around Spitalfields and my grandfather had a haberdashery shop before him, on Brick Lane, M.Courts – it was still there in name until very recently. 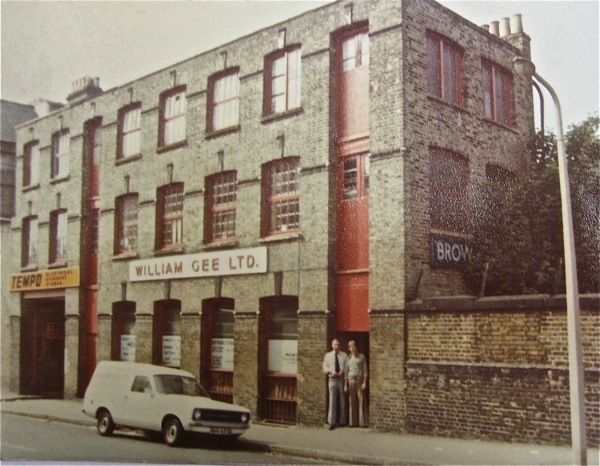 In the early sixties, the two businesses merged and my father became managing director of William Gee and we were supplying manufacturing companies that made uniforms and corporatewear, brideswear companies, hospitals, sportswear companies, hatters in Luton, – anyone really.We were doing a wholesale business in bulk that was very competitive. The heyday was in the sixties through into the eighties, before manufacturers began to have their clothes made by cheaper labour in Eastern Europe, North Africa, or the Far East where much of the clothing is made today. It closed many factories and suppliers, they could not compete. It was no accident that people talk about “sweatshops,” because there wasn’t legislation to control how they should be organised then, but after legislation was enforced employers could not compete with overseas competitors. Leaving this question to resolve itself we set out to visit the departments. First the button department which fills the shop next door, where buttonmaker, Janet Vanderpeer, presides over neat shelves stacked with rare ancient buttons from companies that closed years ago. Here I found her secreted behind a curtain in a cosy den, placidly making fabric-covered buttons at a press. Did she like it? A nod to the affirmative. How long had she been doing it? “A good while.” And without missing a beat she kept the buttons coming. 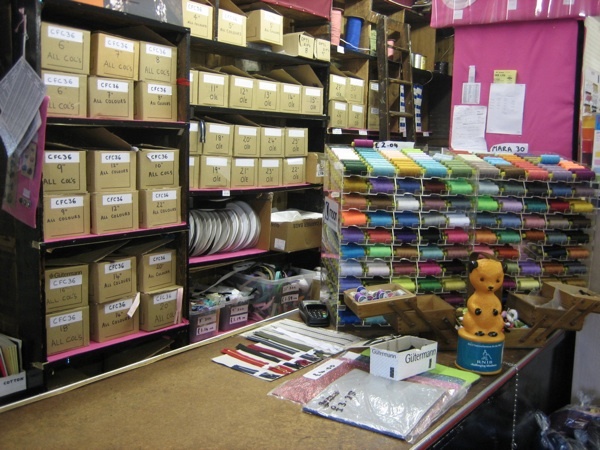 From here, we passed behind the shop to the three storey warehouse where the comprehensive supply of zip fasteners are kept and tended by their own designated keeper “You might think a zip is just zip,” said Jeffrey, rolling his eyes and gesturing to the lines of shelves. Then we stepped out into Forest Close whence the works’ coach parties departed in the nineteen fifties and crossed the road to the large warehouse where Janet’s brother David Vanderpeer, despatch manager, who joined the company thirty years ago at the age of sixteen, inhabits his own cosy den complete with microwave and ceramic leopard. All fourteen staff at William Gee today have been there at least ten years and there is a sense of quiet mutual understanding which enables everything to run smoothly. 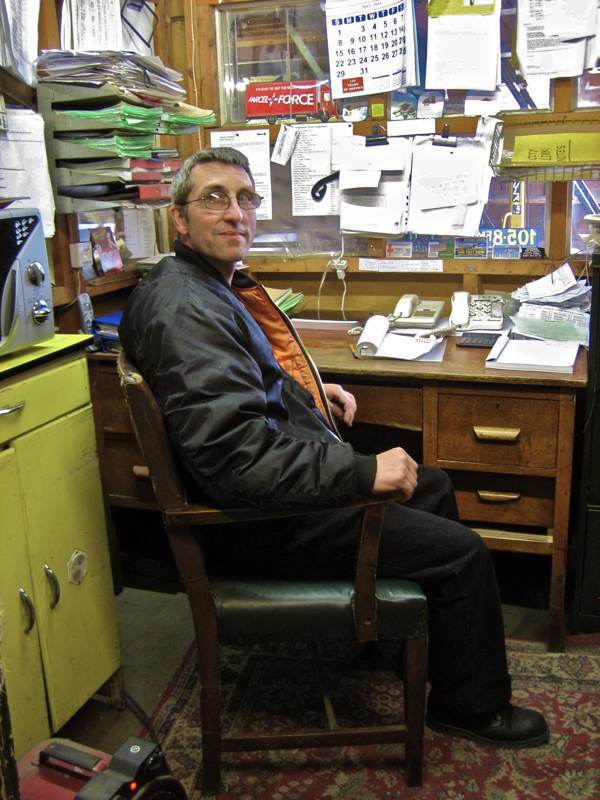 Jeffrey told me a man will come in to say that his grandmother sent him here to buy buttons as a child and then ten minutes later another senior gentleman will come in to say the same thing. 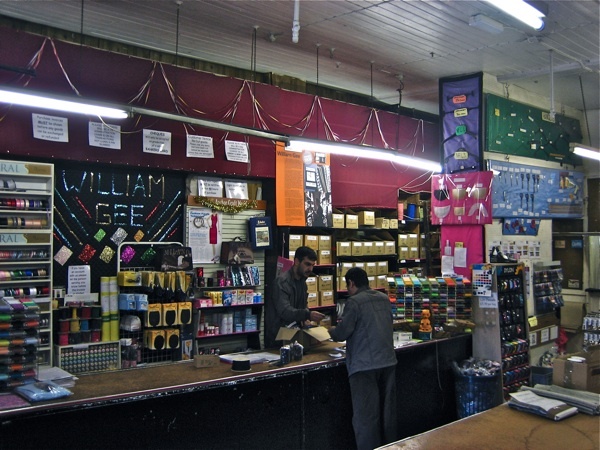 Yet in this appealingly utilitarian shop, that appears sublimely unaffected by any modern intervention, whoever comes through the door to stand between the two long counters is met with respect and patience. Even the old lady who did a high kick to place her ankle on the counter, when I was there, in order to display the kind of elastic she required was met with unblinking courtesy. And when Jeffrey Graham informed me authoratively, “The styles of clothing may have changed but the basic components are the same whatever the fashion.” I could hardly disagree. 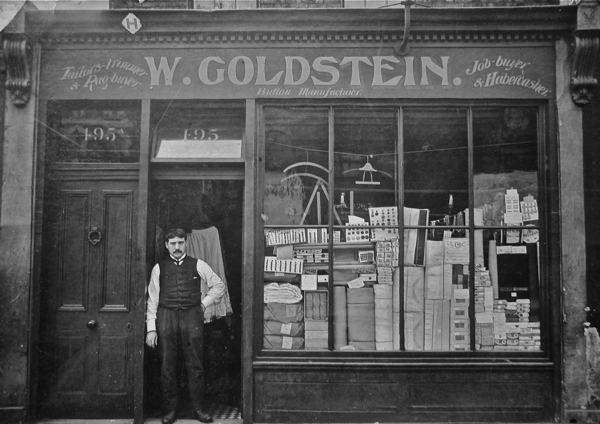 William Goldstein’s haberdashery shop in 1906, that became William Gee. A leaving party for Ivy Brandon in the seventies, with David Graham on the far right and Sidney Gee on the far left. The warehouse round the corner in Forest Rd. 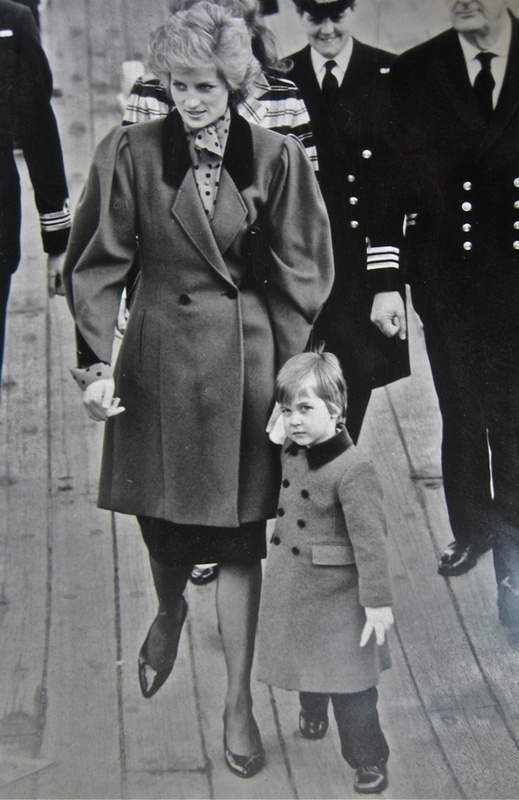 Princess Diana in a coat with lining supplied by William Gee, 1986. 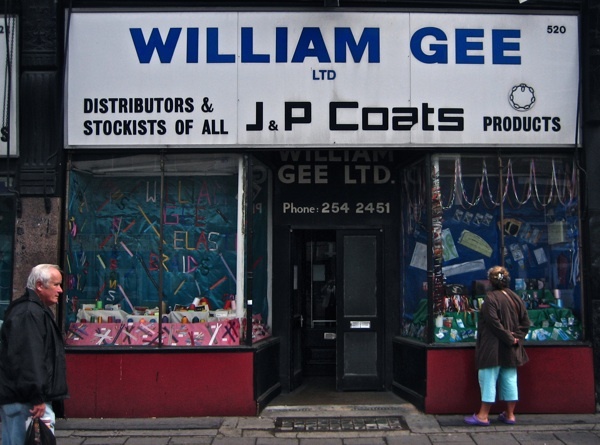 Jeffrey Graham, Managing Director of William Gee. Love the story! 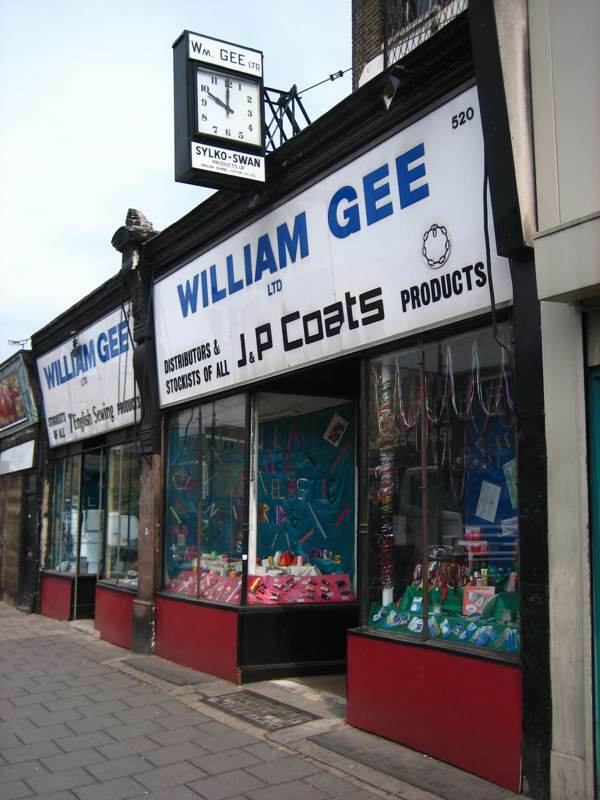 as i work in fashion and involved with the company few times for buying trims, but never knnow the history and background, it is so interesting what you do here…..
Forty years since I’ve been through those doors – and William Gee is still just the way I remember it. Reassuring indeed. GA, your investigations and explorations are truly a trip down memory lane: that whole area of yours was my initial fashion ‘stamping ground’ back in the 70′s, and you keep ‘unearthing’ nostalgic treasures … what will you find next, I wonder? I used to buy trimmings in the late 60′s 70′s as a designer. This is a big trip down memory lane for me. Unearthing all these snippets of history is wonderful. These places you find are treasure troves, how will they manage to be kept the same – in all their glory -when these people finaly give up their work, your blog is so important. How I miss the old Haberdashers of Sydney! You’ve brought them back to life through this wonderful business; Thank you so veery much. I am Alfred GEE’s daughter and I am really astonished that no “real” mention or a photo exists in your article, as he was the life and soul of this business for very many years. In fact my parents lived there at the beginning of their marriage. Why has he been so left out? Keep these story’s of the past going they are so interesting, can’t wait for the next one. I worked there in the button dept from 1957 until 1961. The manager was a Mr Hammond .. 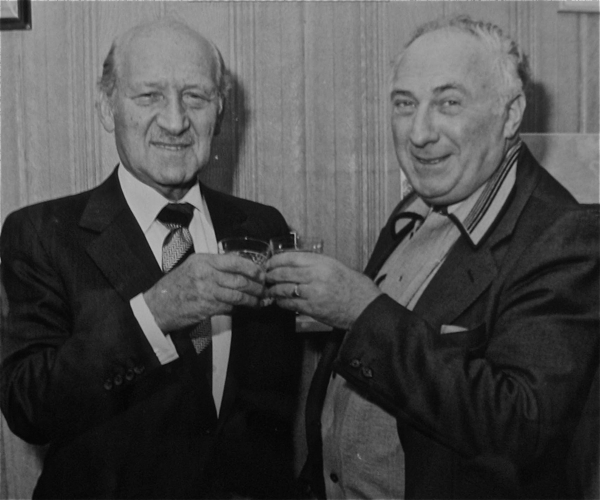 I remember the directors Mr.Alf and Mr. Sid very well……. my mother also worked there for a short time covering buttons with material supplied by customers. Remember the fun we used to have on the annual Beanos laid on by the company……. many names come to mind reading this article and great memories of my time working there.